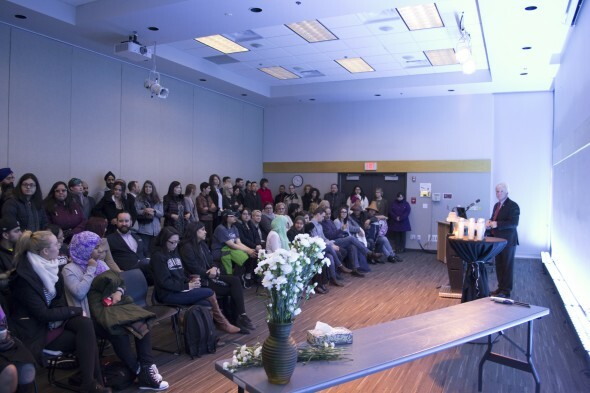 Three days after the tragedy that occurred in Quebec on Jan. 29 the KPU community came together to memorialize the victims while rejecting the hateful rhetoric that lead to the act of violence. Students, staff, and other community members packed into the conference centre on KPU’s Surrey campus for the solemn, hour-long vigil. Several students and faculty members had a chance to speak before a moment of silence was observed, candles were lit, and flowers were laid at the podium in honor of the victims. The vigil was planned by the University along with the Kwantlen Student Association in response to the events that took place in the Quebec City suburb of Sainte-Foy. Just before 8pm that Sunday night a lone gunman walked into the Islamic Cultural Centre of Quebec City as evening prayers were taking place and opened fire, killing six men and injuring seventeen others. The shooter was known to have held white nationalist sympathies and extremist right-wing views and is now in police custody awaiting trial. The vigil was lead by KPU president and vice-chancellor Alan Davis, who opened the proceedings with a few words and introduced each of the speakers. Speakers included psychology professor Dr. Farhad Dastur and members of the KPU Muslim Students Association. Kwantlen First Nation Elder Kevin Kelly and his son Michael Kelly Gabriel also said some words before performing two First Nations songs. Kelly spoke of the importance of Muslim Canadians being able to celebrate their cultural and religious traditions openly and freely just as Kelly himself is able to do as a member of the Canadian First Nations communities. As a Canadian Muslim and a representative of KPU students, Ramini took the opportunity to speak about her story of coming to Canada. She spoke of going to to the immigration office and being told “welcome home” as she was handed her Canadian passport. CORRECTION: We initially reported that it was KPU professor Rajiv Jhangian and KPU elder in residence Lekeyten speaking at the vigil. It was actually KPU professor Dr. Farhad Dastur and Kwantlen First Nation Elder Kevin Kelly speaking at the vigil. We apologize for the error.